Clarets boss Sean Dyche is yet to field any interest in striker Danny Ings - but reiterated he isn’t for sale. Ings himself, Dyche and both co-chairman have recently stated the England Under 21 international is going nowhere in the transfer window. The former Bournemouth man is out of contract in the summer, with talks continuing to see if he can be persuaded to extend his stay at Turf Moor, but for the meantime at least, he is staying put. Dyche said: “There’s only speculation, but we’ve been having that for as long as I remember. I’m used to it. “There’s nothing come into me, no contact. We just get on with it. Asked whether there was a figure which would persuade the club to sell, Dyche added: “Put it this way, Angel Di Maria moved for £65m. Ronaldo moved for whatever and Gareth Bale. “My point is you can never say never but, generally speaking, no. The board have come out and said it – he’s not for sale. “Financially, we don’t have any worries there because we only bought a couple of bags of chips in the summer and that was it. 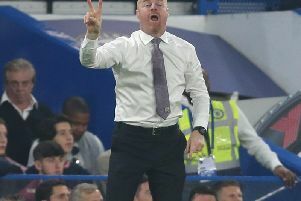 Ings himself proclaimed himself happy at the club again, after the 2-2 draw at Manchester City on Sunday, and Dyche added: “He’s assured everyone that he’ll be here. I don’t need to speak on his behalf, he’s speaking for himself. “It’s just an ongoing situation it’s just life at Burnley. “It’s a good sign anyway. It’s good that people are interested in the players because that usually means there’s life in what you’re doing and life in the club. “It’s a strange one but it’s good. We know he’s part of us and we want it to stay that way. “It’s good that all players want to play for the club they’re at. That goes across the board. You want players who are settled and want to be where they’re at. Teammate Kieran Trippier is also keen to see Ings follow his lead and sign a new contract: “Danny is a massive part of our team. He’s been here a few years now and is doing really well but it’s massive to keep hold of him.